Today I have some reds for you. One is tomato red and the other is vampy red. Both have great application. Boudoir is the tomato red creme shade, which applied perfectly. One coat is almost enough for perfect coverage. Paprazzi is the vampy red creme. It reminds me of blood and vampires. This one came to me by mistake, but I was allowed to keep it anyway (thank you, ABC Beauty Shop ). 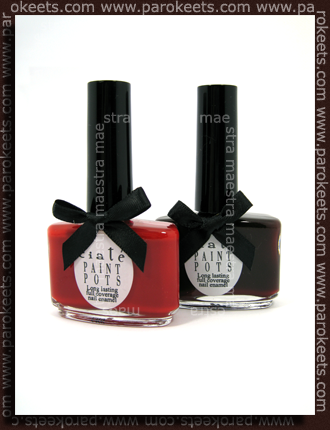 I’m so glad, because this is a wonderful shade and for a creme vampy red it is a dream to apply. It is a tiny bit streaky on the first coat, but second coat evens everything out. Note, that there is only one coat of each color in the picture above. I played with some glitter and flakies. 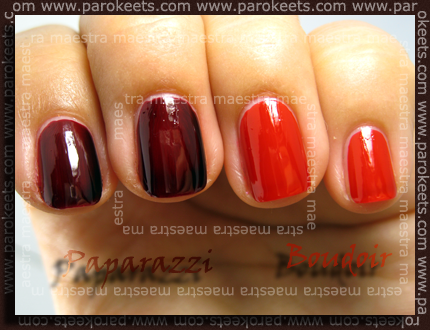 Here are Boudoir and Paparazzi with one coat of Sinful Color‘s Red Ocean #140. I never like flaky polishes, but I’m loving the ones I’ve seen on your site so far – I think it must be the quality of your pictures, they’re great! :whistle: That was a great mistake in your favor! Love both shades. They are gorgeous shades. The Red Ocean really makes an amazing difference in the look. Each polish looks so very different. I really have to try that look. Sinful Colors has so many polish that are sheer. I always forget to layer them. Paparazzi je zelo lep. Boudoir me pa ne mika. Mamy, se strinjam. V dveh slojih je Paparazzi vsekakor temnejši. Po svoje mi je res všeč, če mi uspe v enem sloju dokaj znosen nanos, ker potem se vidi ta lepa barva… Vsekakor je pravi “vampy” rdečko. Tile Ciatki so mi izredno všeč!!! Paparazzi sem dobila namesto Silhouette in moram reči, da sem bila izredno prijetno presenečena. Se strinjam z Maestro, res je neverjetno lep odtenek. Meni se zdi malo temnejši, sploh če gre za nanos v dveh slojih.